2011 – A Huge Success! Congratulations to all those who were involved in 2011's Global Handwashing Day (GHD) celebrations, which took place on the 15th October! We reached tens of thousands of people across the UK and millions worldwide with our simple message: wash your hands with soap! The various 2011 activities drew large-scale attention resulting in over 16,000 GHD website page views during October, with almost 8000 of those on the 14th and 15th alone. A huge thank-you to all those who were part of the campaign and who continue to spread the message. Well done! If you’d like to enquire to find out more about Global Handwashing Day or to become part of the coalition for next year's campaign, please contact us. Please click here to listen to a Podcast of Dr. Val Curtis of the London School of Hygiene and Tropical Medicine talking about a study into Faecal Bacteria on mobile phones and the importance of handwashing with soap and water after visiting the lavatory. Led by the ideas foundation, teenagers embark upon a creative media camp to produce an online media campaign for Global Handwashing Day 2011. To produce a number of outputs targeting primary and secondary school students, including posters, animations, films and teaching materials that aim to raise awareness of the importance of washing hands with soap. Click here to learn more about the Creative Media Camp 2011. Creative Media Camp 2011 created 4 fantastic posters and 2 cool films to help spread the message. There were 13,000 Creative Media Camp posters distributed among workplaces in the UK. Mobile Poo Map of Britain. “Mobile phones can harbor on average 18 times more living bacteria than a flush on a gents’ toilet” (Which? Right, 2010). Using microbial profiling, this study aims to document the microbiological state of mobile phones around Britain, as a vivid demonstration of the need to wash hands with soap. The Mobile Poo Map of Britain sampled the hands and phones of nearly 400 people across the UK and showed how phones act to spread disease. The subsequent press release created a sizeable ‘media storm’ with the headline ‘1 in 6 mobiles contaminated with E. coli’. We hit around 200 articles worldwide, not to mention the many radio and TV interviews about the research with Dr. Val Curtis and Dr. Ron Cutler. School children are an important vehicle for influencing behaviour change in the population. If we can get the next generation to change their behaviour, they will unknowingly contribute to population behaviour change in future generations by passing on their better hygiene habits. 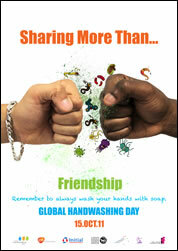 To deliver a simple hygiene message to all school children using newsletters, posters, role-plays and animations. School Councils UK reached out to nearly 30,000 UK schools with a hygiene-based role-play! 'I Dare You' is a bold and engaging way for handwashing with soap to become a strong topic of conversation among all children at home and at school. To inform over 1 million First News readers about Global Handwashing Day 2011, talking to them throught the pages of First News and through our website in a fun but educational way. First News circulated an additional 8,500 Creative Media Camp posters around UK primary and secondary schools and subsidised a full page advertorial, which reached over 1 million young readers.